Who doesn’t love breakfast? Some people may say it’s the same thing everyday, or they don’t have time for it, but trust me, this recipe for cottage cheese Danish pancakes will change your mind really quick. I’ll be honest, I’m not sure how the pancakes came to be dubbed “Danish.” Maybe the powdered sugar sprinkled on top? Maybe the cottage cheese? I don’t know, but it doesn’t really matter. What does matter is the taste (and the ease of making too) and these pancakes rank high on both scales: great taste, one bowl (or blender as it may be) and griddle to make. This recipe came from a friend of my mom’s and over the years, we’ve perfected it to suit our tastes, but at its core it remains the same. Long before protein at breakfast and healthy fats like olive oil were taking center stage, this cottage cheese pancake recipe was conceived, and it’s been a crowd pleaser ever since. And what could be much easier than throwing all the ingredients into a blender to do its thing, pouring onto a griddle for a few minutes and eating? Some of you may be wary of using cottage cheese in pancakes, but surprisingly, you can’t tell it’s in there at all. No weird taste, no lumps, no nothing; just smooth, thick, protein-rich pancake batter. Sprinkle a little powdered sugar on top of the pancakes and you’re ready for breakfast in no time! This will become a favorite in no time at your house. In a blender, combine cottage cheese, flour, oil, eggs, sugar and salt. Blend until smooth. Thin mixture slightly with water, if too thick. Preheat a griddle pan or large skillet on medium heat on the stove top. Coat with cooking spray or butter. Cook until bubbles appear in pancakes (about 2 – 3 minutes per side), flip and continue to cook until golden brown. Plate pancakes and sprinkle powdered sugar (or desired topping of choice) and serve. Enjoy! Add a little fruit and you’ve got a balanced breakfast with delicious Danish pancakes. 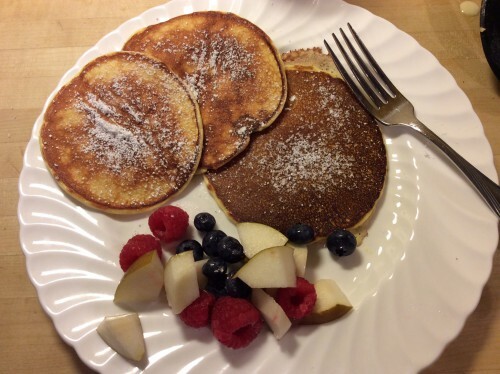 This entry was posted in Breakfast, Recipes and tagged Breakfast, Cottage Cheese, Cottage Cheese Pancakes, Danish, Danish Pancakes, Pancakes, Powdered Sugar, Recipes on October 18, 2014 by Paige N..